Not every Iranian I met during my trip appreciated the fact I went to Qom. Some told me they would never visit this city of fundamentalists. I was also a bit nervous about my visit as a female travelling alone. Qom is one of Iran’s most religious cities. It is home to several theological universities and Khomeini himself finished his education here. 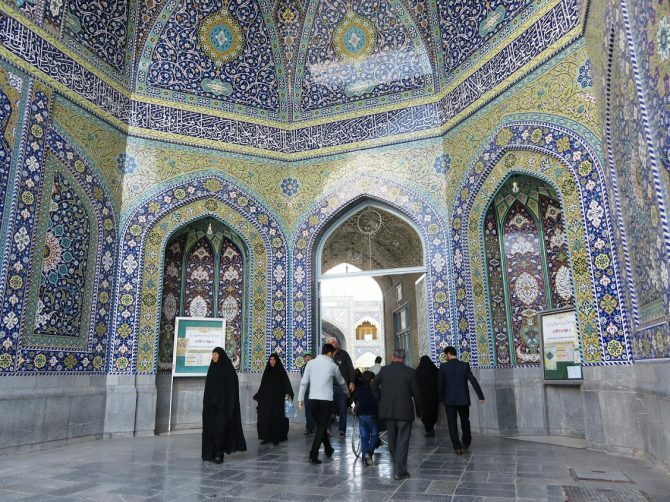 There is also the shrine of Fatemeh, the daughter of the seventh imam and sister of the eight imam, that attracts hundreds of pilgrims every day. Shia muslims believe that there were twelve special people who are the divine processors of the prophet Mohamed. They worship the 12 Imams and their immediate family members. They also believe the last Imam is still alive, but is hiding from us. One day he will reappear as the Mahdi together with Jesus, who will assist the Mahdi in ridding the world of evil. Qom fascinated me and I wanted to understand more about Iran’s interesting religious life. First of all, the shrine of Fatemeh is not a mosque. The Azam mosque is in fact right opposite the shrine, but few people visit it. Most pilgrims head straight to the shrine of Fatemeh. Throughout my journey I noticed that shrines where people that were holy relatives of one of the 12 imams were buried were more popular. People often believe that the shrines have certain powers. Either your prayers will be answered, your dreams will come true or your illnesses will be cured. Shrines and not mosques are at the centre of Iran’s religious life. Next to Mashad, the shrine of Fatemeh, is one of the most important shrines in Iran. My journey started that morning with me deciding what to wear. Should I choose my blue manteau that I bought in Qazvin or was that too colourful and was it better to wear my black Indian top that was maybe too tight and too short? Both outfits were on the conservative side in fashionable Tehran, but I knew Qom was a different matter. Getting to Qom was easy. At the bus terminal in Tehran I was quickly brought into a bus heading south. There was another French tourist in my bus that just finished some kind of spiritual retreat in India. I am still wondering what made him come to Iran, but he was here without money and a guidebook to find out there are no ATM’s in Iran. He was now on his way to Esfahan even tough he did not know where it was. By that time I was happy Qom was only 2 hours away. Of course the French guy had never heard of Qom. Once I left the bus several taxi drivers started shouting ‘haram’ ‘haram’ at me. I did not know that haram in farsi also means shrine. All I knew was that haram in Islam means something that is not allowed by religious law. I was very confused and thought I made the wrong decision to wear my black tunic, when I slowly figured out that it must mean the shrine. My initial worries disappeared when the taxi driver refused to take my money. It was an honour for him to bring a foreigner to the shrine of Fatemeh. Qom turned out to be a friendly place, even tough I was not allowed inside the shrine on my own. At the women’s entrance the women asked me to sit down and wait. They gave me a chador and called the guide for foreigners. An older humble man appeared to show me the shrine of Fatemeh. He was a supporter of the Islamic revolution, but also believed that Islam should be a religion of peace and tolerance and he was troubled by recent events in the world. My guide also encouraged me to take pictures, although that was quite the challenge considering I also had to keep my chador in place. Iranian women walk gracefully while hiding their handbags and groceries under them. I was holding on to it for dear life with gravity that kept pulling it back. Qom was an interesting place to visit and I learned a lot from my guide about Shia Islam. Despite Qom being such a religious city I felt people were friendly and polite towards me as a foreigner. On my way back I had to almost fight again with my taxi driver to pay him. He too, refused to take my money. The tradition of taarouf is a custom of politeness. People will invite you over, or offer services for free. To be polite in return, the offers shouldn’t always be accepted. In both cases I really insisted on giving the money. My first driver kept refusing, but the latter finally took it. It’s easy to visit the shrine in 2 or 3 hours and continue your way to Tehran or Kashan. However, it is worth it to stay at least for lunch in Qom or try some of it’s delicacies in the bazaar. Qom is known for Sohan. A saffron brittle candy with pistachio nuts that is as good as it sounds. Don’t leave without trying it. And there are lots of juice shops where you can have delicious pomegranate juice. It’s maybe not the cheapest restaurant, but Yazdan Panah House is an old historical house that is 120 years old that serves good food, including my favourite stew fesendjoon. If you want to read more about Iran’s food Read my Persian Food Guide: eating your way through Iran. It is easy to visit Qom as a day trip from either Tehran or Kashan. From both cities it is an easy two-hour bus ride. As it is midway between Tehran and Kashan it is also possible to stop in Qom on your way from Tehran to Kashan. Visiting the shrine takes between 2 and 3 hours. To read more about what there is to see in Kashan you can read my post on the best of Kashan: the traditional heart of Iran’s desert. If you have read my story I think you know my answer already. Yes, despite its religious significance Qom is a friendly place for foreigners, whether you are a woman travelling alone or not. When visiting Qom it is better to dress a bit more conservative than in other places in Iran. To know more about what to wear in Iran as a women read my guide on Solo Female travel in Iran: know before you go. The white chador is a praying chador. When praying in their homes, and even in mosques, women don’t usually wear a black chador. By giving you a white chador, they didn’t mean to make you stand out.